Find the most beautiful pictures on your hard drive with which you would like to create a photo collage. Make sure that the photos have a similar colour scheme. This will ensure that the photo collage looks harmonious. It would be advantageous if all photos were taken with the same camera. On the “Photo collage templates” page of our photo collage maker, you can select a template for your photo collage. Depending on how many photos you want to include, you can choose from a selection of templates with between 3 and 29 images. You can also add text captions and select a square or 4:3 aspect ratio for your photo collage. by clicking ‘Add photos’. You can upload several photos at once by holding down the CTRL-key in the dialogue box. The pictures will subsequently appear in the ‘My Photos’ area in the photo collage maker. From here you can create your photo collage online by simply dragging the photos into the desired position. If you want a different picture in this position, simply drag another image into this position. By pressing ‘Auto-fill’, you can automatically fill your collage at random with the uploaded photos. You can repeat this as many times as you like until you are satisfied with the result or you can manually place the photos in the desired position. You can tell whether the quality of your photos is sufficient by moving the mouse over the photos. The image quality will be displayed in the form of a smiley. 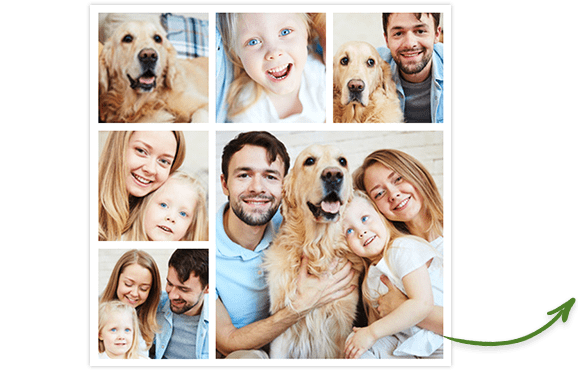 Images showing a red smiley should be replaced in order to obtain good printing results, for example when printing your photo collage on canvas. You can delete the photo in a particular position by clicking on the ‘X’ at the top right corner of your photo. This applies both to the photo collage configurator as well as the ‘My Photos’ area. If the image format of a photo does not correspond to that of the collage, you can reposition your image whichever way you want. Click on ‘Change image selection’ and this will appear as soon as you move the mouse over the corresponding photo. When you are finished creating your collage and the desired layout is ready, click on ‘Finish collage’ to create the finished collage. The picture is then processed and an image file is produced. Depending on the number of images, this can take a few minutes. You can now decide what you want to do with your collage. You can simply download the finished collage free of charge or, for example, print it as a large photo collage on canvas or on any other attractive surface. Simply choose the material for your photo collage and click ‘Order’. Help us spread the news of our free photo collage maker and recommend us to your friends. Enjoy creating your photo collage online! Is there a problem with your order? What isn‘t working? Monday – Friday, from 8 a.m. to 5 p.m. Your collage is now being created in high resolution format. This process may take a few minutes. What do you plan with your collage? Recommend us and share this site with others so that our photo collage service can grow and develop further. After you have shared your collage or recommended us, you can download your collage in web format. Send the photo collage to my e-mail FOR FREE! Just fill in your name, last name and your e-mail address on the right and you’ll receive your photo collage FOR FREE via e-mail. 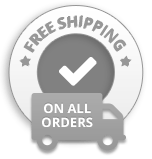 Use this code for free delivery of your order! The code will be transferred automatically.